stiffness, relax tense muscles and improve circulation. A hot stone massage is more expensive than a basic Total Relaxation Massage or Swedish Massage because it requires more preparation and clean-up and usually runs longer. ​Hot Stone massage is not appropriate if you have diabetes, high blood pressure, heart disease, or are on medication that thins your blood. 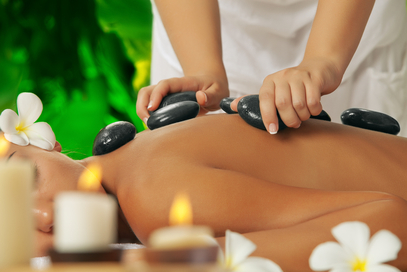 You shouldn't get a hot stone massage if you are pregnant or have a sunburn. You also may want to reconsider if you are menopausal, as it may trigger a hot flash. Experience Draper, Utah's Best hot stone Massage Today!